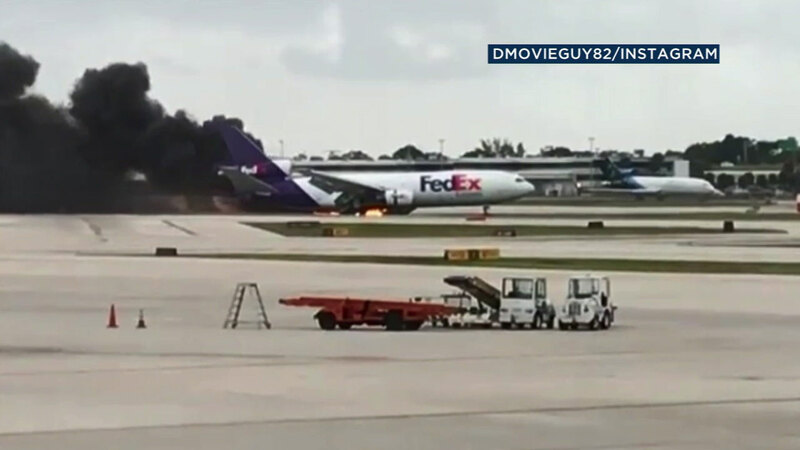 FT. LAUDERDALE, Fla. -- A FedEx plane at Ft. Lauderdale-Hollywood International Airport caught fire Friday afternoon as it was rolling on the runway after landing. According to the shipping company, the main landing gear caught fire as the plane collapsed during arrival. Both pilots escaped from the plane. The plane was arriving from Memphis. Rescue crews quickly sprayed the aircraft with foam on the runway and got the blaze under control. Witnesses at the airport caught footage of the landing gear exploding upon landing.